LARCHMONT, N.Y. (October 11, 2016) – Over 420 college sailors from the United States, Canada and France raced on 45 owner-coached keelboats over Columbus Day Weekend in the Storm Trysail Foundation’s Intercollegiate Offshore Regatta (IOR) sailed on western Long Island Sound. A team from the United States Naval Academy (Navy) sailing the J/44 MAXINE was the overall winner after winning four races and finishing second in one race in the competitive six-boat J/44 class comprised of all service academies. Up until the Tuesday before the 2016 IOR, the forecast for Hurricane Matthew had Western Long Island Sound right in the center of the National Weather Service’s forecast cone. As safety comes before other considerations, the organizing authorities feared the same outcome as at last year’s IOR. In 2015, due to the threat from Hurricane Joaquin the week before the IOR, other regattas were cancelled and many boat owners had hauled their boats or moved them to safer locations. This year, the weather gods treated the IOR more favorably and in a 12-hour period, on the Wednesday morning before the IOR, the forecast had completely changed, sparing a possible hit to the Northeastern United States. After the hurricane potential, it was ironic that the forecasts for the first day were for 2-4 knots of wind, even as late as the evening before. Once again, the weather gods did their own thing and offered up an 8-12 knot northeasterly for a great day of three races with a relatively flat sea state and moderate temperatures. The Navy team on J/44 MAXINE had three bullets on Saturday. The second day of racing was sailed in an increasing northerly, which ironically was an outer band from the now dissipating Hurricane Matthew. The breeze was in the mid teens with some gusts to over 20 knots. The race committee, led by Storm Trysail Club Principal Race Officer Charles “Butch” Ulmer, skillfully got in two races in stronger breeze and wave heights before the conditions became marginal. The 45-boat fleet was divided into five classes: IRC 38’-43’ (9 boats), J/44 (six), J/109 (eight), PHRF (12), and J/105 (10). The team from the University of Michigan won the IRC class sailing the J/133 ANTIDOTE. Finishing second was Webb Institute sailing a Farr 40 provided by Oakcliff Sailing, while third place went to Michigan Technological University sailing the Swan 42 QUINTESSENCE. One point out of third place was the GVSU team sailing on Farr 400 SUNDARI. 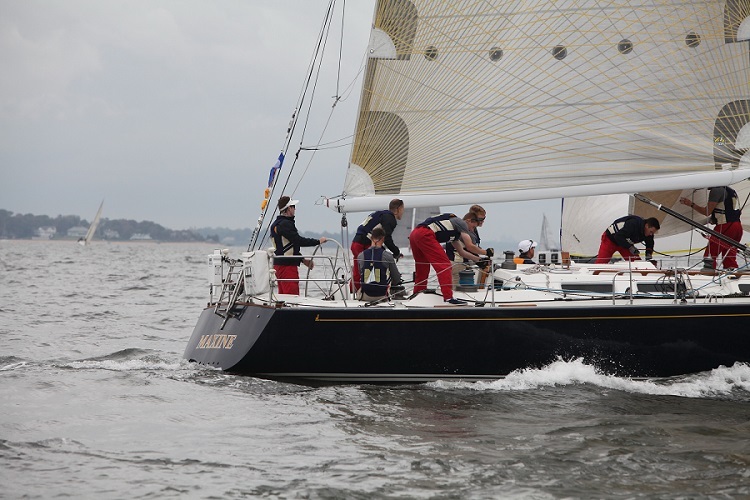 The J/44 one-design class was won by the overall IOR winning team from Navy sailing MAXINE, followed by the United States Coast Guard Academy sailing their own J/44 GLORY. In third place was a team from Massachusetts Maritime Academy sailing the J/44 VAMP. McGill University (Montreal, Canada) won in the J/109 class sailing MORNING GLORY with four firsts, and a fourth. In second place was the team from ENSEIRB-MATMECA sailing on J/109 STRATEGERY, and in third place was Bates College sailing on NORDLYS. The team from ENSEIRB-MATMECA, in Bordeaux, France, earned the right to compete in the IOR as the winners of the 48th EDHEC Sailing Cup raced last April in Roscoff, France; their team won an all-expense-paid (except for air fare) trip to the IOR, thanks to the joint venture between STF and EDHEC Sailing Cup. The EDHEC Sailing Cup is the world’s largest college sailing regatta that draws over 1,500 sailors and 180 boats, and the joint venture with the STF is designed to bring the top college sailors in the world together. As a result of being the overall winner of the IOR, the team from Navy has won an all-expense-paid (except for air fare) trip to the 49th EDHEC Sailing to be sailed from March 31 – April 8, 2017 in France. All U.S. collegiate teams are welcome. The University of Florida St. Petersburg won the J/105 class aboard MAGIC with three bullets, a second and a third, followed by a team from Massachusetts Maritime Academy on GOOD TRADE, and third place in the J/105 class was another team from NAVY sailing ARETE. In the 12-boat PHRF division, Tulane University was first sailing on the J/88 JAZZ with 10 points. Virginia Tech was second sailing on the X-34 MAUDELAYNE also with 10 points, and another team from Navy was third sailing aboard the C&C 115 CONSTANCE. Thanks to sponsors Rolex, Vineyard Vines, Safe Flight Instruments, Pantaenius Yacht Insurance, Flintlock Construction, Dimension/Polyant Sailcloth, UK Sailmakers, Gill, Craft Brewing Co., Coca Cola, and YachtScoring.com, there is no entry fee, and meals are provided for the boat owners and college sailors. Larchmont Yacht Club, whose Commodore Tim Porter graciously welcomed all of the competitors, again hosted the IOR. The Storm Trysail Foundation is a 501(c)3 charitable organization dedicated to supporting the education of sailors, junior safety at sea, and intercollegiate big boat racing. STF educates young sailors as they bridge the gap between learning to sail and becoming accomplished blue water seamen through a national program of events, including junior safety at sea seminars and intercollegiate big boat racing. For more information, pictures and complete results visit http://www.stormtrysailfoundation.org/intercollegiate.htm.